we stayed in zoubulia apartments,its the second time we have stayed there .the room was basic but clean. it had what we needed for our holiday.great location for us .2min walk to the beach and great for the night life.the staff very friendly and seemed pleased towelcome us back for another year.would stay there again. 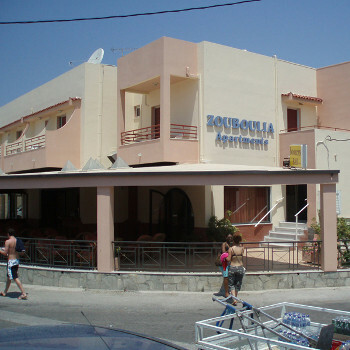 The Zouboulia is a nice and friendly hotel. They have safe deposit boxes for a small charge. Rooms are what you would aspect in Greece. The one thing that is a must and what you don't get in 95% of hotels is air conditioning, which is a must during the summer season. The hotel has a bar and shows movies at night. The night life is just only two minutes away. Status night club is round the corner. The pool is round the back, but only small. I would stay again and i've been to Greece over 25 times in 20 years.